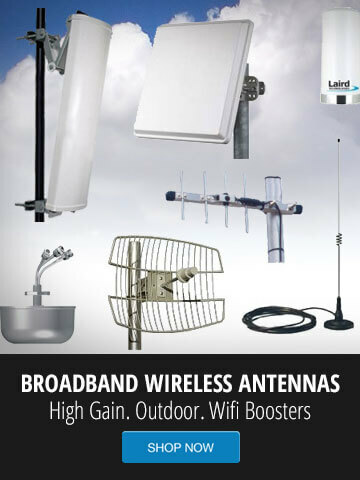 GNS Wireless stocks a wide range of wireless network accessories. For a wireless network to function at the level of instant communication and data transfer that the market demands, certain WiFi accessories must be employed in order to increase the overall performance level of the wireless network itself. Our inventory has top brands from numerous manufacturers that are sure to match compatibility with the system that you currently have running. Wireless networks must also be highly durable to counteract weak signals in rural areas. Wireless network accessories that GNS Wireless has in stock include antennas, splitters, RF Lightning Protection, and grounding accessories. These wireless networking accessories will help to protect and organize your data flow through many environments and secure control of the networking system to be more easily manipulated by those with the proper access. Products from Ubiquiti, Engenius, and D-Link have become industry standard and GNS Wireless ensures these WiFi accessories in stock. Wireless network accessories are a great way to get the most out of your existing point to point wireless network setup. Simple tools such as inline surge protection connect inline between the outdoor radio and indoor POE injector to protect your indoor equipment and outdoor wireless access point. WiFi accessories are a cost-effective means of getting even more functionality out of the equipment that you already own. Computer networking equipment and WiFi accessories let you create the network your employees or home need, whether it's a fast and efficient one that is capable of handling thousands of inquiries per second or a simple one that lets your customers get online. Firewalls give you security, a wireless router connect you via WiFi, a USB wireless adapter provides Wi-Fi on the go, and network attached storage let you store everything you need. GNS Wireless also stocks IP Security cameras for networked security that record everything and transmit that information over your network, or a wifi extender to extend the range of your network. Wireless Network accessories also include WLAN signal boosters that let your wireless Internet or intranet devices reach workers located farther away from access points. This can increase productivity by giving workers throughout your business center access to the same tools as those used by workers currently in range of the access points. To set up a new Internet connection in your office for guests or workers, try a high-powered router, or wireless network amplifier. WiFi accessories for networking devices include omni-directional antennas that allow you to create excellent signal strength throughout your home or business location. Adding more antennas to your current setup can boost signal strength as well as area saturation. This leads to more effective wireless networking in your business center or home, reducing the problems associated with interference or weak signal strength. Contact GNS Wireless for more information on your wireless network equipment.